Okabe Rintaro is just another science-loving university student, albeit one with a chuunibyou complex. 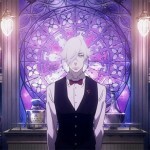 He spends his days in his makeshift lab in Akihabara, creating “evil” inventions together with his super hacker friend Daru and cosplay-loving childhood buddy Mayuri. When Okabe and Daru tries to make a phone-controlled microwave they unintentionally end up creating a time machine instead. Although they cannot physically use the microwave to go to the past they can send emails back in time. And of course they abuse the hack out of their invention and send multiple mails to the past, with various results. 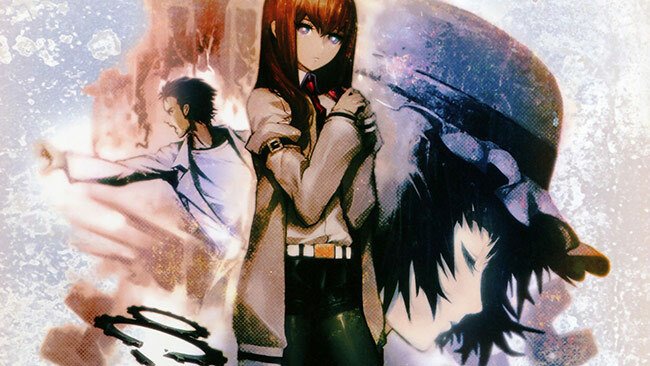 With the help of the genius scientist Makise Kurisu they further expend on the time machines’ powers and slowly begin to understand its inner workings. But messing with time is a dangerous undertaking and the dreadful butterfly effect soon hits Okabe with a vengeance. A terrible day unfolds in which Okabe’s world is shredded to pieces and reality becomes unbearable. There is only one way for Okabe to prevent that horrifying reality from happening – time travel to the past and redo everything and anything possible in order to find a solution. Steins;Gate is very different from your typical visual novel. It takes place in a real place (Akihabara), makes references to real companies, and deals out scientific theories and facts at a frantic pace. It is a Dan Brown take on visual novel story telling. Steins Gate’s story offers a unique combination of drama, comical relief and petrifying horror. I must admit is starts off very slow. The story takes a couple of hours to really pick up and Okabe (or Hoein Kyouma if you prefer his “evil genius” name) is also a certified jerk. But as the hours went by I began to understand why this visual novel is so highly praised. When the action finally arrives it hits and hits hard. There is a certain point in which everything clicks and you enter a long and rewarding emotional roller-coaster. The terribly effective suspense audio tracks and the unforgiving horror scenes shook me badly. It has been a while since a visual medium had managed to make me care so much, or has caused me to mentally feel sadness or fear the way Steins Gate did. As the game’s episodes went by and I got to know the acting characters better I found most of them to be likable. Even Okabe, which I hated at first, grew on me once I understood the reason he acts like a chuunibyou brat all the time. Since this is a visual novel the way you “play” the game is mostly comprised of passive reading. You do get to make decisions from time to time by sending email messages to the various lab members Okabe adds to his laboratory. The emails and responses you send, or not send, to people affect the progress of the story, although not always in predictable ways. This visual novel isn’t exactly a light reading material. You will need to invest a considerable amount of time if you were to finish Steins Gate. It took me 22 hours to get my first ending, and a total of 55 hours to get all the endings in the game. 55 hours may sound like a lot of time, but since the game has 5 different possible endings 11 hours a pop is actually pretty reasonable. The game’s art style should also be mentioned. It is beautiful and enchanting, and it makes me sad to know that the anime based on the game used a simpler art style for convenience sake. I played the English PC version of Steins;Gate, in which the entire spoken dialog is dubbed (in Japanese) and there’s in-game trophy support. Each time a character says a key word, that word and a concise explanation about it is added to an in-game glossary. This is a fantastic solution for people not well versed in Japanese culture and 2ch forums slang. There are also images and music galleries that open up little by little as you play. The game experience is not perfect though. Steins Gate lacks the option to auto-skip scenes you already saw. Instead, you can only fast-forward them, which is tedious and a waste of time. Another big issue, which I briefly mentioned above, is that while you can change the outcome of the story by sending emails it is nearly impossible to predict the outcome of these emails. In order to get to the last (true) ending you must answer most of the emails in a specific manner – a feat almost impossible, unless you retry the game for hours on end or use a guide. That said the last chapter of the game is a must. Far from disappointing me, all the effort it took lead to an amazing and is immensely satisfying conclusion. And that really sums up my opinion on Steins;Gate. It’s a time investment and can be boring at times, but each time you reach a pivotal plot point the payoff you get for sticking around is huge. Steins Gate is the best visual novel I have played in years and definitely the best visual novel you can officially purchase in English today.